Beth Comstock’s book is coming in 2018! Beth Comstock, GE’s Vice Chair of business innovation tackles the core issue that keeps business people up at night around the world – how to make sense of continual change and disruption, by developing a new mindset and system that anticipates the future, spots trends early, and nurtures new ideas and methods for growth. 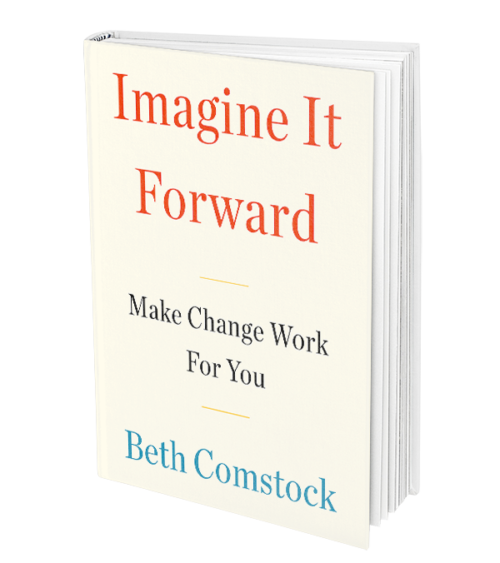 In Imagine It Forward, Beth Comstock tells us the story of her transformation from shy publicist to Chief Marketing Officer to the first woman Vice Chair at GE, as well as the story of her efforts to shift GE, a company known for its emphasis on process perfection and top-down management, to an adaptable, 21st century digital industrial. The newly emerging world is one where the only constant is change, where experimentation and imagination become essential business capabilities. This means every business manager facing transformation – which indeed is every manager – must become adept at fast iteration, have a higher tolerance for failure and ambiguity, and prepare for multiple futures at once. To do this, Comstock shows managers how develop a new mindset to make change work in their favor. In a deeply personal and candid narrative filled with stories from her two decades at GE, Comstock reveals how she overcame her introverted nature and personal setbacks to uncover the new, the unusual, even the weird — meeting new people constantly, exploring and nurturing ideas from the edge, testing methods that seed new growth, and learning how to work with and bring along naysayers. In the course of her career, she became a pivotal change maker, helping her company successfully grapple with rapid-fire change in industries ranging from media to health, energy, transportation, manufacturing, finance and software. Her book offers a rich portrait of a quintessentially American company embracing today’s global disruption while attempting to become a leading company of tomorrow. Beth Comstock has been the Vice Chair of GE, leading GE’s efforts to accelerate new growth and overseeing GE’s Business Innovations which develops new businesses, markets and service models including Current, GE Lighting and GE Ventures. Named Chief Marketing Officer in 2003, she was promoted to President of Integrated Media at NBC Universal in 2006, overseeing ad revenue and the company’s digital efforts. Written about and profiled extensively in the media, from the New York Times to Forbes, Fortune and Fast Company, she has been named to the Fortune and Forbes lists of the World’s Most Powerful Women. She is a member of the board of Nike. Join our launch team to work with Beth on her new book and be part of the publishing process. Brought to you by our friends at Read It Forward, a community of avid readers from The Crown Publishing Group at Penguin Random House. Find your next great read from Read It Forward’s curated bookshelf, 14 Complex, Experimental, and Ambitious Epic Novels by Women.